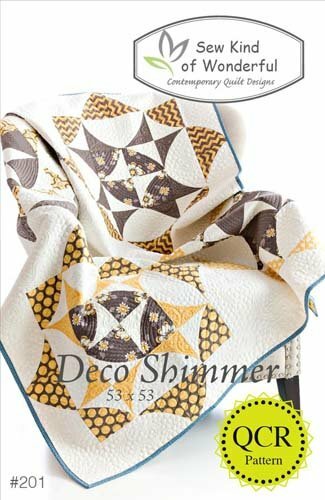 Deco Shimmer #201 designed by Jenny Pedigo for Sew Kind of Wonderful. Sew Kink of Wonderful patters are truly hot on the market. They offer great patterns for those who like the more contemporary quilt design. These patterns have a total classic look. Unique and striking. I have seen these patterns made using traditional fabrics and they were awesome as well. This quilt size is 53" x 53". It is easy to vary the size you prefer to make. THIS PATTERN IS TO BE USED WITH QUICK CURVE RULER. That is what QCR pattern means on the front cover of each pattern.